All She Cooks is excited to be a Brand Ambassador for Pick ‘n Save. Summertime, summertime! What else is there to say, folks? Besides Grilled Chicken Kabobs that is? When I think of summer in Wisconsin, I think of barbecue grills, hanging around outdoors with friends and family, and the summer flavors of grilled meat and fresh tasting vegetables. If I have a nice glass of vino to wash it all down with, all the better. If you’ve meandered around the recipes here on All She Cooks, you probably know that I like simple food. Give me a recipe that I can whip up in a hurry and you’ll be my best friend for life. Don’t get me wrong. I LOVE to cook. I also like to develop easy-to-replicate recipes that the average (and even beginner) home cook can easily make–stress and hassle free. Who wants to be tied down in a hot kitchen when there are so many other things to be done? You can have great food without back-breaking labor and intensive training. You can also have a lot of fun while cooking. Take a simple ingredient like boneless, skinless chicken breasts: there are limitless possibilities of recipes that can be made with this simplistic age-old ingredient. Trust me, I came up with a few dozen ideas myself when I was contemplating what to make for the first post in my Pick ‘n Save Recipe Series. I had this wonderful ingredient to work with Simply Roundy’s natural chicken, which has so many amazing things going for it. Picture chicken raised and processed without antibiotics, added hormones, steroids or animal by-products, chicken that is fed an all vegetarian diet, air chilled, and is never frozen. There are 6 different varieties, including the boneless breast I decided to cook with, but there is also thin sliced breast, tender, boneless thigh, drumstick, and whole fryer. I use metal skewers for grilling all the time. They are can be used again and again, and unlike wooden skewers, they don’t require additional prep time of soaking. So, when you want to throw something on the grill in a hurry, metal skewers are a huge problem solver. Confession time. I have never owned a gas grill. I’ve thought about it before, but my husband talked me out of it, and I have to say that was the best thing that could have happened. There is something about the flavor attained from cooking on a charcoal grill that cannot be matched. Not to mention the aroma that the entire neighborhood enjoys when someone is cooking out. Can’t. Be. Beat. We love cooking meat on the grill, but I also try to keep our meals a bit balanced by adding in a salad or other vegetables. I have a friend who is the master of adding fiber to every meal, and have to admit that has been instrumental in reminding me of the importance of having a well-balanced diet for my family. Not to mention that adding vegetables to a meal is super simple. For Spicy Grilled Kabobs fiber-loaded side dish, I simply opened, drained and rinsed a can of black beans, drained a can of corn, cut up a tomato and what was left in my refrigerator of a red onion, and chopped up a small handful of cilantro from my garden. Simple, right? I tossed all the ingredients together in a bowl and served it up with our tasty chicken kabobs. My husband ate it like a black bean salsa, while I ate it like a fun summer salad. Perception is all in the eye of the beholder. Either way, it was delicious because both the cold summer side dish and the Spicy Grilled Chicken Kabobs were gone in no time. Follow along with us as we continue to bring you easy recipes that you can make at home, all with little to no previous cooking experience required. Our goal here at All She Cooks is to bring you recipes you can enjoy at home that won’t stress you out. We want you to enjoy cooking, learn something along the way, and become a more confident home cook. Chop up chicken into approximately 1-inch pieces. Put on metal skewers with chicken pieces placed up against each other. Lay raw skewered chicken on a baking sheet or cutting board and sprinkle to taste with paprika and cayenne pepper. Flip skewers and sprinkle more seasoning. If you like a lot of spice, be liberal with the cayenne pepper. If you like food more on the mild side, a light sprinkle of cayenne pepper will suffice. Prepare grill. We prefer to use a charcoal grill for optimal flavor. Set in refrigerator until time to put on grill. If using a charcoal grill, place towards the sides of the grill and not over direct heat. Keep an eye on the chicken kabobs while cooking and turn over once during the cooking process. 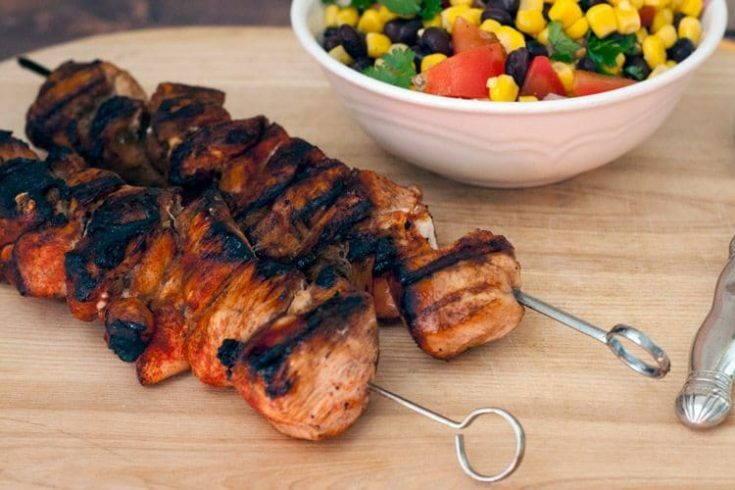 Remove chicken from kabobs when finished cooking and serve with your favorite summer side dishes. Combine ingredients in bowl and stir. Serve either as a side salad or with chips. Leave a comment. What type of recipe would you like for us to feature in our Pick ‘n Save Recipe Series? Simply Roundy’s natural offers products that I can be proud to cook with and serve to my family. Pick ’n Save’s organic foods are minimally processed and always free of additives, and artiﬁcial colors and ingredients. If you need help finding the packaging, I’ve include an image below so you will know what to look for.